It’s 6 o’clock on a weekday evening. Little ones are looking up at you like they haven’t eaten in days. You have a couple of random vegetables (not enough for an entire side dish, of course! ), an onion, and a meat. What do you do? What do you do?!?! Kabab ’em. Dinner is ready in a snap and there’s hardly any clean up. Plus, who doesn’t like food on a spear? Deadly weapon and food conduit? Awesome. 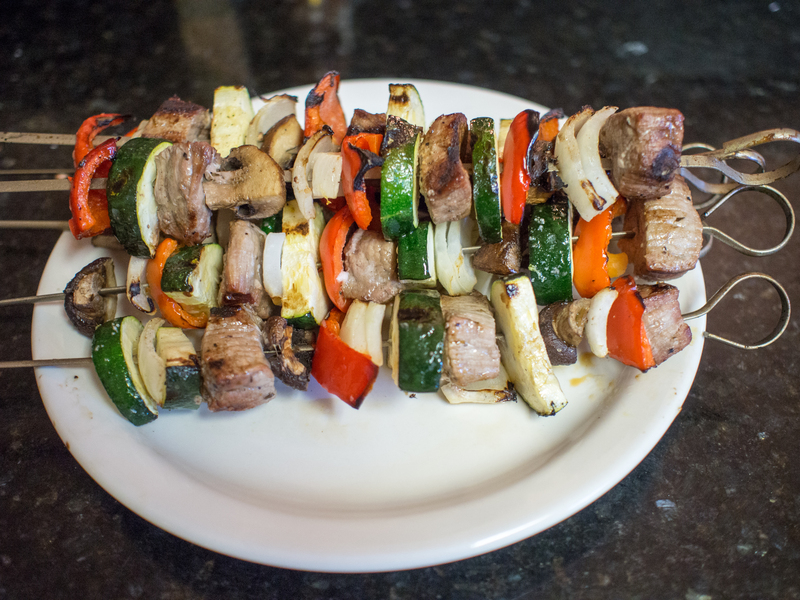 Kebabs are super easy and fun. Extremely kid friendly. Except for the whole they could poke their eye out part. Take the food off the spear for children who are unable to handle sharp weapons, of course. I could give you a huge marinade and tell you to boil it together and cool it off, then place your meat in it. I could. But I won’t. I used a bottle of organic Italian dressing on my beef. Any sirloin steak or “London Broil” will do. The beef need not be fancy or expensive. You could also do boneless chicken meat, or shrimp as well. 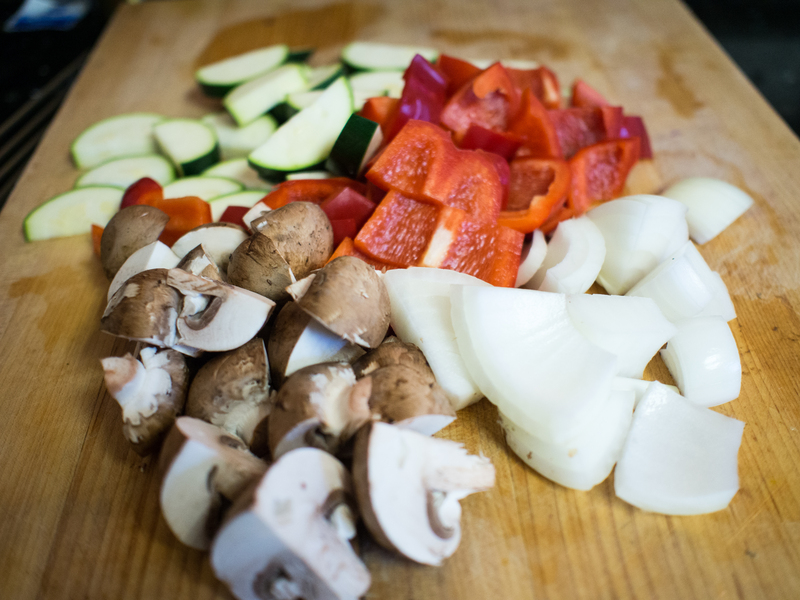 For the veg, just cut into rather substantial pieces, so that they stay on your kabob spear. For grilling, the key is to heat the grill up before you start. I have a propane grill (in addition to my charcoal smokers) that I use all summer. Love it. The lack of dishes to clean and the fact that the heat is located outside and not in the house is just so convenient. To this simple dish, I’ve added a sauce. The sauce is also simple, but really strong to pair with the beef, so it is purely a “dip” and not a pouring sauce, if that makes sense. In another life, the sauce could totally replace a certain steak sauce that begins with an “A” and ends with a “1”. The sauce was inspired by a recipe on the food network that looked way to vinegary to me: (http://www.foodnetwork.com/recipes/porterhouse-with-balsamic-steak-sauce-recipe/index.html) You might ask why I used port. I’m part of a wine club and every Christmas I get a bottle of port. I have no idea what to do with the port, so I cook with it. If I think I can get away with it in a recipe, in it goes. It totally works here. Marinate the beef in the Italian dressing for at least 8 hours. 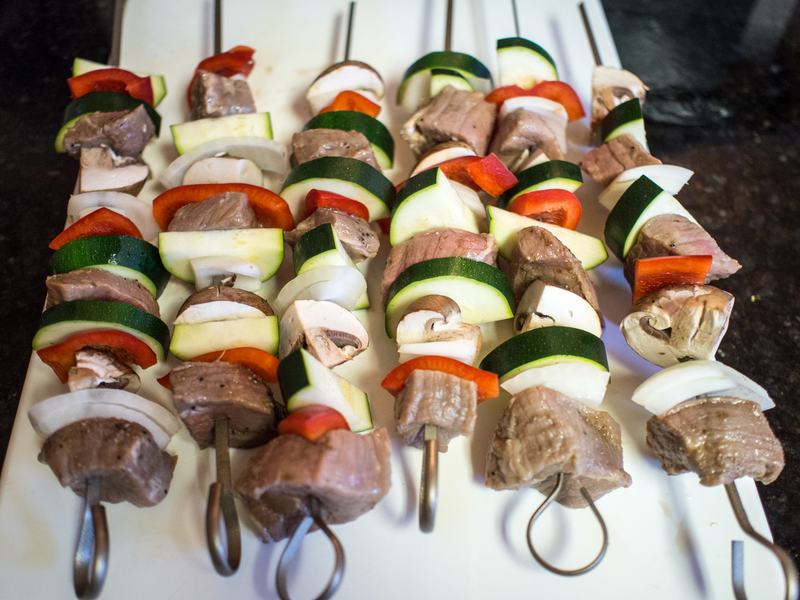 Skewer the beef, zucchini, mushrooms and onions in an alternating pattern on a skewer. Combine the olive oil, salt and pepper. 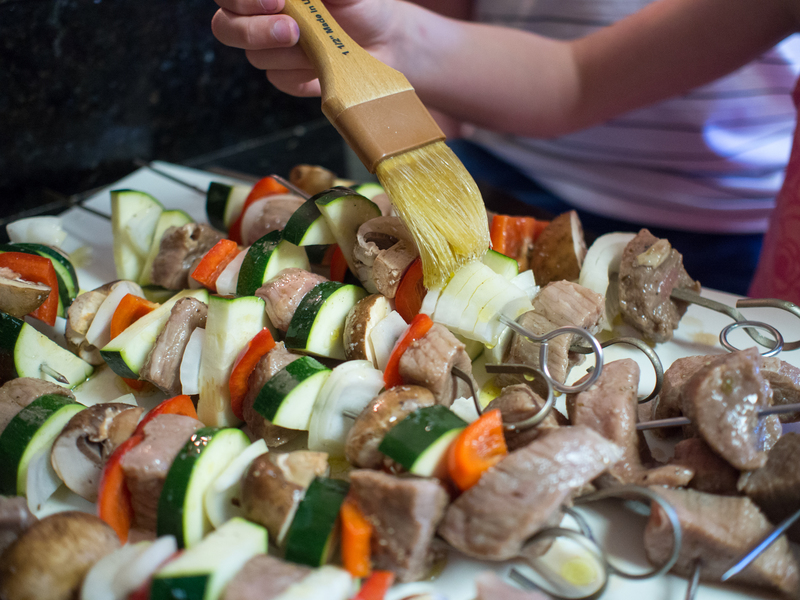 Brush on skewers. In a small sauce pan over medium heat, combine the balsamic vinegar, port, ketchup, honey, onion, Worcestershire sauce, mustard and allspice. Stir until well combine. Let simmer for about 10 minutes. Taste and adjust to your liking with salt, pepper and sugar. 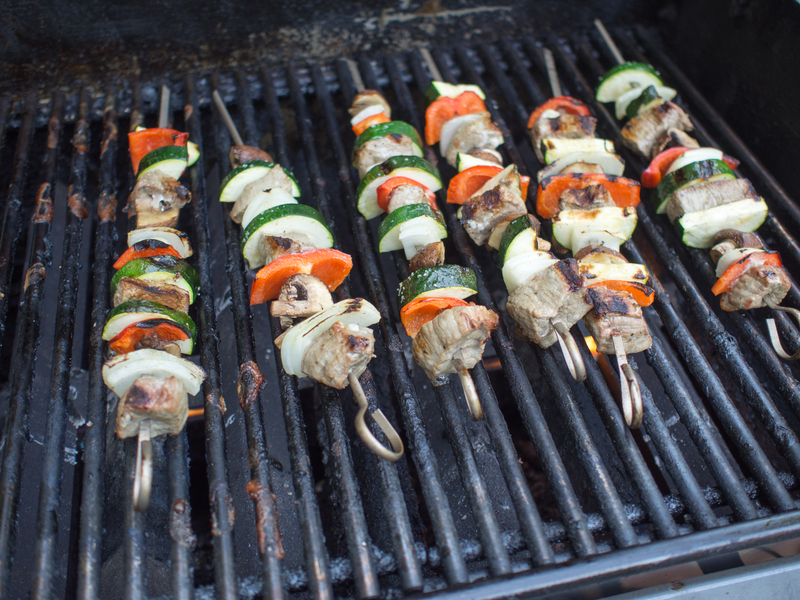 Place the skewers on the grill for about 4 minutes. Turn over. Cook until the meat is at a food safe temperature, approximately 4-6 more minutes. This depends on the size of the steak cube and the temperature of the grill. Remove from grill and serve with sauce. 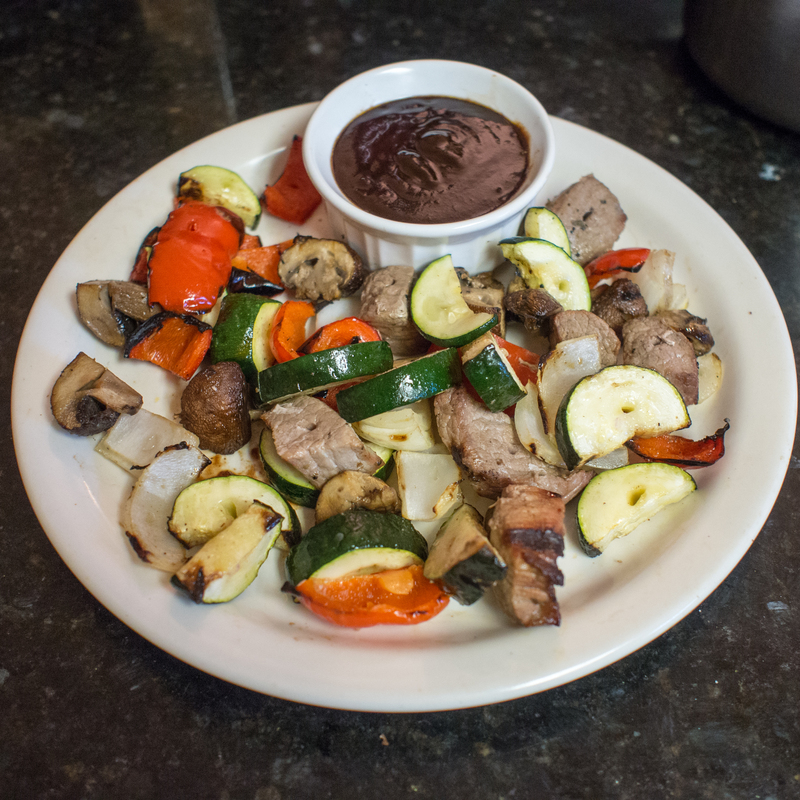 This entry was posted in Beef, Gluten Free, Low(er) Carb, Main Dishes, Vegetable Side and tagged Barbecue, Barbecue grill, beef kebab, Kebab, London Broil, Low Carb, Sirloin steak, steak sauce on June 3, 2013 by dawn of food.